In many ways, retaining top employees often depends on whether or not your company provides health benefits, along with the overall quality of those benefits. However, rising premiums and healthcare costs can make it difficult for small business owners to offer health insurance to employees. One way that companies are addressing this challenge is by incorporating wellness programs into their health plans. With a top notch wellness program, a company can help prevent healthcare claims before they happen. To date, the American Heart Association has recognized more than 1,200 “fit-friendly” companies to encourage employees to participate in healthy activities. The goal is to cultivate healthier employees and lower overall healthcare costs. Many workers have poor health habits and chronic disease rates are growing due to increases in life expectancy, resulting in a new interest in workplace wellness programs. 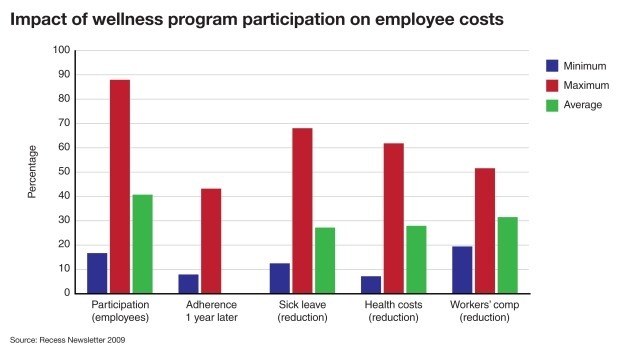 Wellness programs, according to Health Policy Briefs, can reduce absenteeism and employee turnover. Additionally wellness programs can pay off by reducing business expenditures for employee’ health care plans. However, there is debate about how best to structure wellness programs. Some companies offer “carrots”, financial rewards for participating in wellness programs, while others penalize employees for not participating in them. The question on many business owners’ minds is: Should employees be rewarded for participating in wellness programs or be penalized for not participating? When the Affordable Care Act was passed, it expanded employers’ ability to reward employees who met health status goals through participation in wellness programs and to required those employees who don’t meet health goals to pay more for their employer-sponsored health coverage than their peers. One critique of this approach is that the ability to differentiate in health coverage costs among employees could be unfair by resulting in employers policing workers’ health. While every wellness program is different, they typically start out with a health risk assessment, which evaluates the employee’s current health and their risk of developing a chronic disease like diabetes. Along with that, wellness programs typically come with an incentive for taking the risk assessment, such as decrease in health insurance premiums, reward points to purchase merchandise or even cash in some cases. Along with risk assessments, wellness programs may also entail screening for high blood pressure, cholesterol and behavior modification programs like tobacco cessation, weight management and exercise. In many instances, employees that choose not to participate in the assessment may face penalties like paying higher premiums or not having the same access to a cheaper, better plan. Additionally, it’s not unheard of for employees to save between $10-$15 on each paycheck for participating in a wellness program, amounting to a yearly savings of $390. Moveover, the larger the company, the more likely it is to offer a wellness program. In fact, nearly all companies with over 1,000 employees offer one. Typically, these larger employers run their own wellness programs. However, when it comes to smaller companies, wellness programs are often run by the same firm that administers the employer’s health plan or by a third party administrator. In addition to hard medical costs, wellness programs are likely to lead to reduced absenteeism, higher productivity and increased morale among employees. However, timely communication must be maintained with employees and results should be constantly reevaluated. If you decide to implement a wellness program at your business, keep in mind that offering incentives can go a very long way when it comes to driving employee participation. And one of the keys to success in any wellness program is establishing a culture of health within your organization. You need top-down support, but you also need support at the grassroots. Having wellness advocates in your workforce helps promote and perpetuate the services offered by your program. Research and literature suggests that wellness programs actually do end up reducing healthcare costs, despite a lot of skepticism from critics. According to a review of 36 peer-reviewed studies of wellness programs in large firms, average employer medical costs fell $3.27 for every dollar spent on wellness programs. Additionally, costs for days that employees were absent fell an average of $2.73. In 2005, a meta-analysis of 56 published studies on health promotion programs at organizations of all sizes found an overall reduction of about 25 percent in sick leave, health plan costs, workers compensation and disability costs. Despite widespread support for and adoption of wellness programs among both employers and employees, many business groups, consumer advocates, insurance companies and members of Congress have expressed concerns over various aspects. Particularly, there is the concern that health-contingent programs tie rewards or penalties to people’s achieving standards related to health status, especially in the case of arrangements that affect employee health insurance premiums or cost-sharing amounts. They argue that it may be unfair to penalize and employer’s entire workforce and that rather than improving health, health care costs may simply be shifted from the healthy to the sick. In the end, this would undermine health insurance reforms that prohibit considerations of health status factors in determining insurance premium rates. These are just some of the arguments against wellness programs, however, most employers and employees are pro-wellness program. What do you think? Think about whether or not your employer offers a wellness program. Do you participate? Are you penalized for not participating? As more employers introduce wellness programs into their health plans, it will take time to see how the burden of costs is shifted. If the skeptics turn out to be right, we may end up seeing a reduction in wellness programs offering. For the sake of being a healthy society, let’s hope for the best.